It is designed to induce the right posture in consideration of the body shape of the child who is actively growing vertically. The center of gravity is designed not to go backward due to the characteristics of infanthood at the head. Material: -With the elasticity and resilience HR sponge, it maintains the same feeling as the first time even if it is used for a long time. -It is resistant to life pollution by using artificial leather which is easy to manage, and it is possible to easily remove stains with neutral detergent. Design:Fabric ear points that utilize the details of the bears. In order to make the details of black bear aco, the ear points of the fabric that matches the body are added to the completeness of the product. Eco-Molded Sponge: It is made of eco-friendly mold sponge containing plant-derived ingredients. It is made lightweight and low in weight to make the product light and portable, and has high density and excellent resilience of sofa. Style: Aco sofa is also suitable for living room. For children who need protection at all times, the Aco Sofa can be used in the living room together with a seated desk, so you can do various activities with your child while keeping the child's posture. 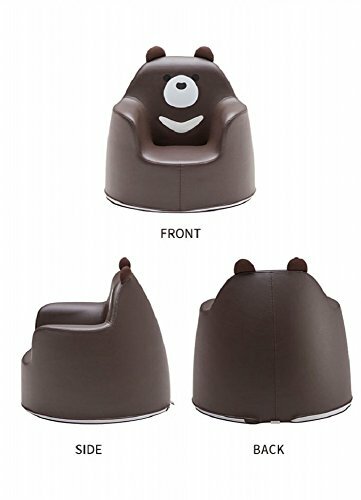 Ergonomic design, Designed to induce a child's right posture, The lower part is designed to be wide so that the head of the infant does not fall back. Smooth edges, Reduce the irritation of touching parts of the body, It gives a visually supple feel and gives physical and mental comfort. Made of artificial leather, resistant to contamination. If you have any questions about this product by i-loom, contact us by completing and submitting the form below. If you are looking for a specif part number, please include it with your message.